"Well, we are just under budget but we have another two months to go which is a month more than we planned but that is OK because the scope blew out a bit early on and that was all approved. It has taken more hours then we expected to complete the current phase, but we worked over the Christmas break, which was expensive, but we used lower level cheaper resources so it didn't cause too much problem. Given everything, I think we will probably be all right." What does it mean? It sounds like an elaborate smoke screen and it quite possibly is. On the other hand, perhaps the Project Manager doesn't understand how the question should be answered. Usually the person asking the question has no specific measurement in mind. They just want a warm and fuzzy feeling. It is unlikely a response to a question such as: "What particular aspect of the project are you interested in?" Would shed any light on what was behind the question - unless of course the person was an accountant. In this white paper, we use an example set up in Project Administrator software that measures these six criteria. It can be viewed on this site (www.projectperfect.com.au/project-administrator-software.php). Project Administrator measures the six parameters and presents the results on one screen as traffic lights, or a project dashboard. 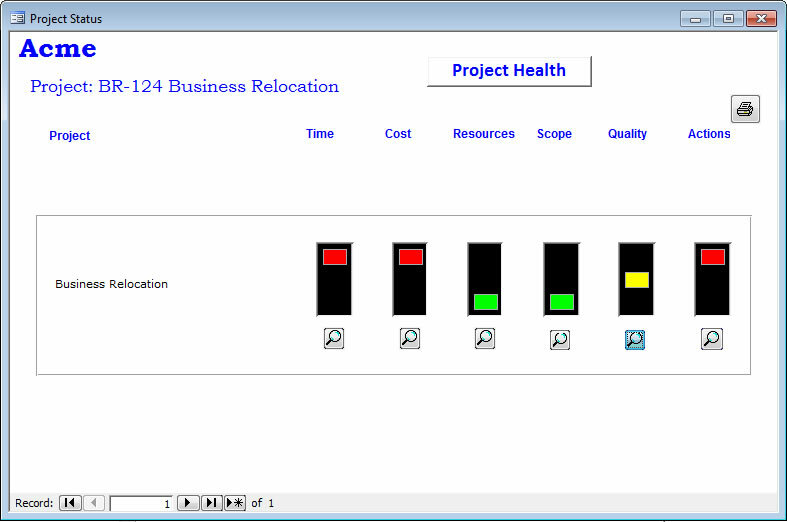 If they are all green, the project is performing satisfactorily in all areas. If one or more are yellow, there is a potential problem. If any are red, it indicates the area needs urgent attention. This technique does not measure trade off's regarding the quality of the resources. The quality will be largely covered by the budget. If less skilled resources are allocated to the project, the cost will be lower and consequently the expenditure against budget will be less. It may however require longer to complete the work, or more resources may be needed. A better way is to admit the blindingly obvious at the planning stage - there will be scope changes, and we need to allow for them. The next step is to put in place a tracking system with approvals. At the start of the project, estimate how much scope increases are likely to be as a percentage of the estimated budget, and as each increase is approved, monitor the total scope creep. Taking this a step further, an action has three parts. Someone, has to do something, by a particular date. Someone means one person. It does not mean two people or a team. Immediately more than one person is responsible, the finger pointing starts. "I thought he was doing it!" Better make one person responsible for the task even if they have to recruit others to help. To date, 636 people have rated this article. The average rating is 3.43 - Add your rating. Just select a rating and click the button. No other information required.